This is the final Legislation Watch for 2010. The Sentencing Amendment Bill 2010 was introduced and passed last week. It had looked like the bill would be put before Parliament and prorogued like the Crimes Amendment (Forensic Procedures) Bill 2010. To the surprise of many (including, it seems, in the parliament), the legislation was put to a vote in the final week of sitting before the government goes into caretaker mode. The Second Reading speech is here. The Explanatory Memorandum is here. The Statement of Compatibility is here. The contents of the bill had been foreshadowed for a long time. Driving while suspended or disqualified was the most common principal proven offence in the Magistrates' Court in 2007-2008 despite the mandatory 'sentence of imprisonment' for a second or subsequent offence. When talk of ditching suspended sentences entirely was popular there was some concern that magistrates would be left with no other option but to sentence mums and dads to immediate imprisonment for offences under s 30. This legislation represents a halfway point. It doesn't eliminate suspended sentences (only for serious offences) but does amend the Road Safety Act to remove the mandatory imprisonment for a second offence. Serious offences are listed in s 3 of the Sentencing Act 1991. I believe the only one commonly dealt with in the Magistrates' Court is the offence under s 20 Crimes Act 1958 (threats to kill). Courts will no longer be permitted to suspend sentences of imprisonment for these selected offences. These new orders replace Intensive Correction Orders and Combined Custody and Treatment Orders (CCTOs). Unlike ICOs these orders are not burdened with the fiction of being a term of imprisonment. ICMOs may be awarded with or without conviction. There are two types of ICMO. The Explanatory Memorandum explains the difference between the two. • An offender must be convicted or found guilty of an offence punishable by imprisonment. • The court must be satisfied that if the ICMO was not available, it would consider sentencing the offender to a term of imprisonment. • The court must have received a pre-sentence report. These prerequisites are intended to provide that an ICMO (General) is an order one-step below imprisonment in the sentencing hierarchy and is a community based sentencing option. Ordinarily the sentence would apply to offences which are in their nature and/or gravity medium to high or high in seriousness and to an offender at risk of further offending. • The offender must be dependent on or abuse drugs and/or alcohol. • The dependency or abuse must have contributed to the offending. 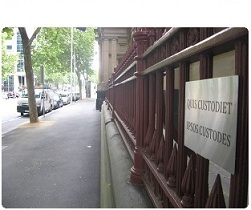 • The offender must be a risk of re-offending. Drug or alcohol "abuse" includes not only repeated use but also "binge" use. "Binge use" is large consumption of drugs or alcohol from time to time. Accordingly, an additional prerequisite for this order is that a court has received a drug and alcohol assessment report in addition to receiving a pre-sentence report. Not all IMCOs will require community work. Where community work is required, an IMCO made in the Magistrates' Court has a maximum of 500 hours unpaid community work over 2 years, and an IMCO in the Supreme Court and County Court has a maximum of 600 hours unpaid community work over 3 years. Under the new regime a Community Based Order made in the Magistrates' Court, County Court or Supreme Court has a maximum of 300 hours unpaid community work over 2 years. Under the old system orders of 500 hours duration were possible but, as discussed here a couple of weeks ago, orders of more than 200 hours are rare. The Bill has a default commencement of 1 January 2012, but 1 July 2011 was suggested as a likely start date during the Second Reading. VLA will be granting assistance in less than 1/3 of CBO cases. I wonder whether they knew that this was coming or whether they will change their plan now it has become public knowledge. What about the ICMO's? Now they are non-custodial it will be interesting to see what approach VLA takes to them. I haven't read up on it but I can see even less of a difference between an ICMO and a CBO than the old ICO. Here's some interesting facts from the Sentencing Advisory Council's own Suspended Sentence Profile.